Running is a great mode of exercise for most people. It is free, requires little equipment and is super for body and mind. If are new to exercise, just getting outside in the fresh air for a walk or a jog will do you wonders. For those who have been running for quite a while, maybe it is time to take things up a notch. Over time your body will adapt to a particular training stimulus so it is important that you change the intensity, distance, speed etc. 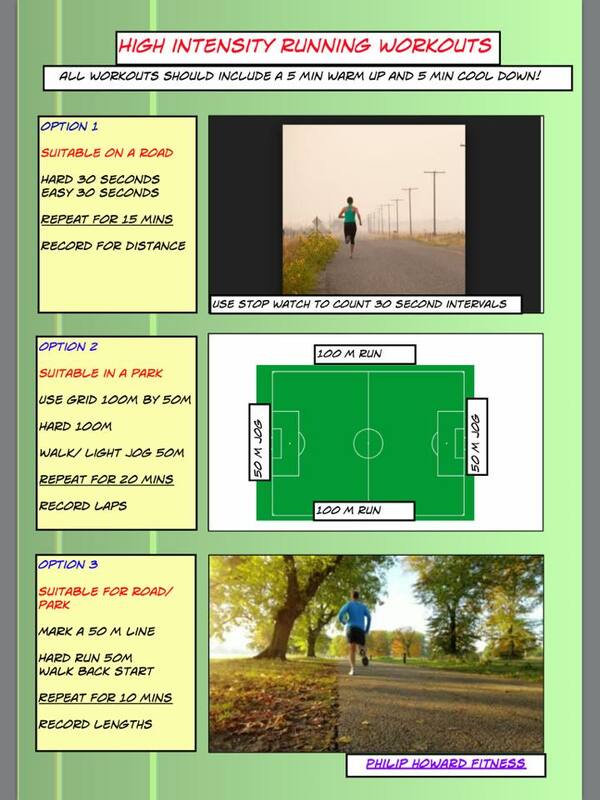 Interval type running is a great way to get an excellent workout in a short space of time. Short intense bursts have been shown to be effective in increasing metabolic rate thus helping with the fat loss process, improving health markers and increasing fitness levels. So have a look at the picture provided, pick a new workout and give it a go!